Mouse embryonic stem cells can be differentiated to T cells in vitro using the OP9-DL1 co-culture system. Success in this procedure requires careful attention to reagent/cell maintenance, and key technique sensitive steps. Here we discuss these critical parameters and provide a detailed protocol to encourage adoption of this technology. Kučerová-Levisohn, M., Lovett, J., Lahiji, A., Holmes, R., Zúñiga-Pflücker, J. C., Ortiz, B. D. Derivation of T Cells In Vitro from Mouse Embryonic Stem Cells. J. Vis. Exp. (92), e52119, doi:10.3791/52119 (2014). The OP9/OP9-DL1 co-culture system has become a well-established method for deriving differentiated blood cell types from embryonic and hematopoietic progenitors of both mouse and human origin. It is now used to address a growing variety of complex genetic, cellular and molecular questions related to hematopoiesis, and is at the cutting edge of efforts to translate these basic findings to therapeutic applications. The procedures are straightforward and routinely yield robust results. However, achieving successful hematopoietic differentiation in vitro requires special attention to the details of reagent and cell culture maintenance. Furthermore, the protocol features technique sensitive steps that, while not difficult, take care and practice to master. Here we focus on the procedures for differentiation of T lymphocytes from mouse embryonic stem cells (mESC). We provide a detailed protocol with discussions of the critical steps and parameters that enable reproducibly robust cellular differentiation in vitro. It is in the interest of the field to consider wider adoption of this technology, as it has the potential to reduce animal use, lower the cost and shorten the timelines of both basic and translational experimentation. A cell culture system has been established in which mouse embryonic stem cells (mESC) are differentiated to T cells in vitro.1 This system exploits the ability of Notch signaling to drive T cell differentiation.2 The OP9-DL1 cell line was created by transducing bone marrow-derived OP9 cells3 with a Notch ligand, Delta-like 1 (DL1).4 Activation of the Notch signaling cascade in vitro facilitates T cell development to the exclusion of other cell lineages. With the inclusion of appropriate cytokines, this system provides a cell culture “microenvironment” that supports the sequential advancement of mESC toward hematopoietic and ultimately T cell lineages. This system supports the flow cytometric identification of T cells at the various developmental stages seen during normal T cell ontogeny in the thymus. For investigating selected questions relating to T cell development, this procedure has become an attractive alternative to in vivo whole mouse models5 and in vitro fetal thymic organ culture methods used to elicit T cell development from mouse embryonic stem cell derived hematopoietic precursors.6 The major advantage of the OP9 co-culture system is that it involves standard and straightforward cell culture techniques and does not depend on the continual use of experimental animals. We follow a detailed, previously published protocol in our experiments using this approach.7 We have utilized this technology to examine the hematopoietic differentiation products of non-manipulated mESC clones, high quality mESC clones handpicked to make chimeric embryos8 and stably-transfected ESC clones coming directly out of drug selection.9 We have noted that the temporal kinetics of initial in vitro differentiation from mESC to mesoderm-like colonies in this model can be variable among individual clones. The mESC-OP9 co-cultures can be visually assessed for progression to mesoderm. While this will usually be completed by the fifth day of co-culture, among individual clones, completion can be delayed for one or two days. Quantitative (~80-90%) mesoderm formation must be achieved prior to transfer in order to obtain optimal hematopoietic progenitor cell (HPC) formation and robust lymphopoiesis. Thus, when working with multiple mESC clones, this “day 5” passage is best delayed until all clones complete the transition to mesoderm-like colonies. This enables synchrony of subsequent development among the clones after their transfer into hematopoietic differentiation conditions. Three days after the passaging of the 80-90% mesodermal formations, HPCs are collected from the OP9 monolayers. HPCs can be seeded on new OP9 cells to allow differentiation of monocytic, erythroid and B cell lineages. Alternatively, HPCs can be seeded on OP9-DL1 cells and driven towards T cell development. All in vitro differentiation cultures are provided Flt-3L beginning at day 5, with further addition of IL-7 beginning at day 8. Flow cytometry analyses performed at various time points during the experiment enable monitoring of progress through the stages and lineages of hematopoietic differentiation and T cell development. CD4/CD8 double positive (DP) T cells begin emerging by day 16 of the co-culture, and both DP and CD8 single positive (SP) cells are abundant by day 20. The general outcome and robustness of co-culture is greatly dependent on the ability to visually ascertain the completion of the significant developmental turning points that occur. This protocol aims to be a guide to the recognition of these milestones, as well as the other critical parameters, that are key to successful differentiation. Prepare ES cell media by using Dulbecco’s Modification of Eagle’s Medium (DMEM) with high glucose and sodium pyruvate. Add 20% ESC Qualified Fetal Bovine Serum (FBS), 1% Penicillin/Streptomycin, 1% L-glutamine, 1% HEPES Buffer, 1% Non-Essential Amino Acids, 0.1% Gentamicin (50 mg/ml) and 0.1% (55 μM) β-mercaptoethanol. Sterilize ES cell media by filtration. Prepare OP9 media by making 1 L of Alpha Minimum Essential Medium (α-MEM) from powder according to the manufacturer’s instructions. Add 20% Fetal Bovine Serum (FBS) and 1% Penicillin/Streptomycin. Invert to mix. Sterilize by filtration into two 500 ml aliquots. NOTE: The use of media made from powder is recommended and likely to yield improved OP9 cell maintenance and in vitro differentiation results. This approach has become our standard procedure. However, we also note that we have at times used pre-made liquid α-MEM with adequate success. Prepare freezing media by adding 10% Dimethyl Sulfoxide (DMSO) to 90% FBS. Swirl gently and sterilize by filtration. Store at 4 °C. Prepare 2,000x Flt-3 ligand (10 μg/ml) by dissolving human recombinant Flt-3 ligand (Flt-3L) in complete OP9 media to 10 μg/ml. Aliquot into 1.5 ml microcentrifuge tubes and store at -80 °C. Follow the supplier’s recommendations regarding stability and storage. NOTE: The stability of Flt-3L is short (1 month at 4 °C or 3 months at -80 °C). Prepare 1,000x IL-7 (1 μg/ml) by using complete OP9 media. Aliquot into 1.5 ml microcentrifuge tubes and store at -80 °C. Follow the supplier’s recommendations on stability and storage (IL-7 is stable for up to 12 months at -80 °C). Prepare 1,000x Leukemia Inhibitory Factor (LIF) (10 μg/ml) by a 1:10 dilution of 107 units of LIF in ES cell media. Store aliquot at 4 °C. Be sure to note the expiration date provided by the manufacturer on the aliquot vials. NOTE: Product is stable in concentrated or diluted form at least 18 months from the date of manufacture. Prepare gelatinized 6-well plates by add 1.5 ml of 0.1% gelatin solution into each well of a 6-well plate. Leave dishes in the sterile hood at room temperature with lids on, allowing at least 30 min for coating. The dishes may also be left in a humidified incubator overnight. Remove any leftover gelatin solution right before cell seeding. Do not let the gelatin solution completely dry out in the well. NOTE: Incubate all cells in a humidified 37 °C incubator with 5% CO2. Quick-thaw a frozen vial (~5 x 106 cells/vial) of mitomycin C-treated (or otherwise mitotically arrested) MEFs and transfer them to a 15 ml tube. Add 8 ml of ES cell media to the thawed cells, in a drop-wise fashion to gradually dilute the DMSO from the freezing medium. Centrifuge cells at 400 x g at 4 °C for 5 min. Carefully remove the supernatant and resuspend the cell pellet in 3 ml of ES cell media. Prepare a 50 ml centrifuge tube with 33 ml of pre-warmed ES cell media. Add the 3 ml of resuspended MEFs to bring the final volume to 36 ml. Distribute 3 ml of the resuspended MEFs into each well of two gelatinized 6-well plates. Place the plates into the incubator for at least six hours to allow the cells to attach and spread out before seeding the mESCs on them. These mitotically arrested feeder layers may be usable for several days after initial seeding, if their media is changed every 2-3 days. NOTE: Freshly arrested MEFs can also be used. Quick-thaw a vial with a frozen mESC clone in the 37 °C water bath and prepare cells as described in 2.1.1-2.1.3. NOTE: We freeze 2 vials of mESC from a confluent well of a 6-well plate. Remove media from one well (per mESC clone) of the 6-well plate with arrested MEF monolayers (prepared in step 2.1.5) and seed the 3 ml of mESCs on top of the MEF monolayer. Add 3 µl of 1,000x LIF (10 ng/ml). Return dishes into the incubator. NOTE: Change media daily, or split based on confluence of mESC. Optimally, harvest and split/re-plate the cells every other day. Remove ES cell media and wash mESCs with 2 ml of PBS. Remove PBS. Add 1 ml of 0.25% trypsin and incubate at 37 °C for 3-5 min. Collect trypsinized cells and transfer them into a 15 ml centrifuge tube. Vigorously pipet the cell suspension to break up clumps of mESCs. Add 2 ml of complete ES cell media to the cell suspension to neutralize the trypsin. Spin cells at 400 x g for 5 min at 4 °C. Remove supernatant and resuspend the pellet in 3 ml ES cell media. Remove media from 6-well plates containing prepared arrested MEF monolayers. Add the appropriate amount of the cell suspension (based on the desired split ratio) in 3 ml of ES cell media to each well to be seeded. Add 3 μl of 1,000x LIF. A confluent mESC well split 1:6 will be ready for passage in 2 days. Add 7 ml OP9 media to 10 cm tissue culture dish. Add the 3 ml of resuspended cells in a drop-wise manner, distributing cells throughout the plate. Place the cells overnight in the incubator. Check the confluence of the OP9 cells the next day. If the dish contains many dead floating cells, remove the media and add 10 ml of fresh OP9 media. Return the dish to the incubator if nearly full confluence is not observed. Split (using trypsin) 1:4 the near confluent OP9 monolayer. NOTE: Plates should reach same confluence level again in about 2 days. Take care not to let OP9 cells become over-confluent. Freeze the early passages of OP9 cells as expansion stocks. NOTE: We freeze 2 vials of OP9 cells from one near confluent 10 cm dish. Each vial of expansion stock can be further propagated to create working stocks that are later used in mESC co-culture experiments. Keep all OP9 stocks frozen in liquid nitrogen rather than in the -80 °C freezer, since fluctuating temperatures can negatively influence the quality of the freezes. Approximately one week prior to initiation of a co-culture, thaw MEFs, mESCs and OP9 cell working stocks. Since OP9-DL1 cells are not needed until co-culture day 8, thaw the OP9-DL1 cells during the first three days after co-culture initiation. Maintain or freeze all cells as needed. Determine the initial number of 10 cm plates with OP9 cell monolayers prepared to reach 80% confluence on co-culture day 0 based upon the scale of the experiment (e.g., number of mESC clones to be differentiated and number of co-culture time points to be analyzed). To prepare for a co-culture, split near confluent dish of OP9 cells between 1:4 and 1:6 two days ahead of when the monolayers will be needed. NOTE: One will need at least one plate per ESC clone. Typically, a single ESC clone seeded on a single plate (as described below) on day 0 should yield enough cells to seed six plates at the day 5 passage. Each day 5 plate will enable one subsequent analysis time point. Since OP9 monolayers will be continually needed for co-culture passage, take care to always maintain an adequate number of additional OP9 culture plates in parallel with the co-culture. Collect mESC as in 2.3.1-2.3.4. Count the cells. For each mESC clone prepare 5 x 104 mESC in 10 ml of OP9 media per plate. Remove old media from OP9 dishes and add the 10 ml of mESC suspension to the dishes taking care to distribute the cells evenly throughout the plate. Place the dishes in the 37 °C incubator. Remove dishes from the incubator and observe under the microscope. Colonies should begin to lose shininess and appear flattened. Remove media from dishes and gently add 10 ml of fresh OP9 media. Return the co-culture dishes to the incubator. Visually monitor mesoderm-like colony formation daily to inform the timing of OP9 feeder monolayer preparation for the next passage (day 5), which should not be carried out until ~80-90% of the colonies visually display mesoderm-like morphology. Maximum postponement of the day 5 cell transfer step is 2 days. Day 5: Trypsin mediated passage with pre-plating. NOTE: Prepare in advance an adequate number of 10 cm dishes with optimally confluent OP9 cells. Proceed with the next steps only if the co-cultures visually display the features described in step 3.3.3 (see also Representative Results). Remove media from the co-culture dishes. Add 4 ml PBS to wash. Swirl the PBS and remove. Add 4 ml of 0.25% trypsin and place the dishes in incubator for ~5 min. Disrupt the layer of trypsinized cells by vigorous pipetting, taking care not to introduce excessive air bubbles, until a homogeneous, mostly single cell suspension is achieved. Add 4 ml of complete OP9 media and mix by pipetting. Transfer cells into a new, empty 10 cm dish and place in the incubator for 30 min to allow the OP9 cells to adhere to the dish. This “pre-plating” step reduces the number of OP9 cells transferred to the next step of co-culture. Prepare 50 ml centrifuge tubes with 40 μm cell strainers. Collect non-adherent cells from the pre-plated dish and pass them through the cell strainer into the tube. Wash the dish gently with 6 ml of PBS and pass it through the same strainer, leaving the attached OP9 cells behind. Centrifuge cells at 400 x g 5 min at 4 °C. Remove supernatant and resuspend pelleted cells in 3 ml of complete OP9 media. Count the cells. Remove the media from 10 cm plates with optimally confluent OP9 cells. For each analysis time point, seed 5 x 105 cells on the OP9 monolayer in 10 ml final volume. Add 5 ng/ml human recombinant Flt-3L and place the dishes in incubator. NOTE: Prepare in advance an adequate number of 6-well plates with OP9 or OP9-DL1 cell monolayers so that they will be ~80% confluent in time for this step. Prepare 50 ml centrifuge tubes with 40 μm strainers. Remove the dishes from the incubator and observe under the microscope. Shiny clusters of HPCs should be loosely attached to the OP9 monolayer. Collect as many of these cells as possible by washing (but not overly disrupting) the OP9 monolayer with a pipette and the existing media on the dish. To prevent foaming, always leave at least 1 ml of the media in the tip of the pipet during this HPC collection/washing step. Pass the cells through the 40 μm strainer into a tube. Add 8 ml PBS to the same plate and check under the microscope if all HPCs were collected. Repeat the washing/collection step with PBS and (if necessary) with more forceful washing. Strain the cells into the tube already containing the cells from the same plate. Centrifuge cells at 400 x g for 5 min at 4 °C. Prepare a master mix of 3 ml (per plate seeded on day 5) of OP9 media with 5 ng/ml Flt-3L and 1 ng/ml IL-7. Remove supernatant and resuspend pellet in OP9 media with Flt-3L+IL-7 master mix (3 ml for each 10 cm dish processed). Transfer the collected cells from each plate into one well of a 6-well plate with OP9 cells. In order to drive cells toward monocytic, B cell or erythroid lineages, seed the collected cells onto OP9 cells. To derive T cells, seed the cells onto OP9-DL1 cell monolayers. Place the 6-well plates into incubator. Prepare a 15 ml centrifuge tube for each distinct mESC clone-feeder cell type combination in co-culture. Prepare a master mix of OP9 media with 5 ng/ml of Flt-3L and 1 ng/ml of IL-7. Prepare 3 ml for each well. Gently collect media from each well of the 6-well plate combining media from multiple wells containing the same ESC clone-feeder cell type combination. Add 2 ml of OP9 media master mix (see 3.6.2) into each well. Centrifuge the collected media at 400 x g for 5 min at 4 °C. Remove supernatant and resuspend each pellet (very small if visible) in 1 ml of OP9 media master mix (see 3.6.2) per well originally collected in step 3.6.3. Distribute 1 ml of cells back into each well from which the media was originally collected bringing the volume in each well to 3 ml. Return the dishes to the incubator. NOTE: Prepare in advance an adequate number of 6-well dishes with OP9 or OP9-DL1 cells so that they will be optimally confluent in time for this step. Day 12 is ideal for flow cytometry analyses of developing erythroid, monocytic, and early stage T cells. Prepare a master mix (3 ml for each well that will continue in co-culture) of OP9 media with 5 ng/ml of Flt-3L and 1 ng/ml of IL-7. Prepare 50 ml centrifuge tubes with 40 μm strainers (one for each ESC clone-feeder cell type combination in co-culture). Vigorously pipette the existing media in each well to disaggregate all cells (including the monolayer) in the well. Continue with forceful pipetting until a state resembling a single cell suspension is achieved. Pass the collected cells through the strainer into the tube. Add 3 ml of PBS into each well to wash and collect all remaining cells. Pass cells through the same strainer. Combine cells from multiple wells containing the same ESC clone-feeder cell type combination. Discard the used cell strainer and remove an aliquot equivalent to one well (~6 ml) for any desired flow cytometry (or other) analyses to be carried out on that day. Store these aliquots on ice before use. Centrifuge cells at 400 x g for 5 min at 4 °C. Remove supernatant. Resuspend the pellet from the 50 ml centrifuge tubes in 3 ml of master mix per well to be re-seeded. Add 3 ml per well of each cell suspension on to the appropriate feeder cell type and place the dishes in the incubator. Follow the steps outlined in section 3.6. NOTE: Prepare in advance 6-well dishes of optimally confluent OP9 or OP9-DL1 cells for this step. NOTE: Day 16 is ideal for flow cytometry analyses of B lymphocytes and middle stage T cells. Follow the steps outlined in section 3.7. NOTE: Day 20 is ideal for flow cytometry analyses of mid to late stage developing T cells. Follow the steps outlined in section 3.7. If desired, carry differentiating cells past day 20 alternating media change and no trypsin passages every two days, with daily monitoring of the lymphocyte expansion rate. When grown on MEFs in the presence of LIF, mESCs can be maintained in an undifferentiated state. 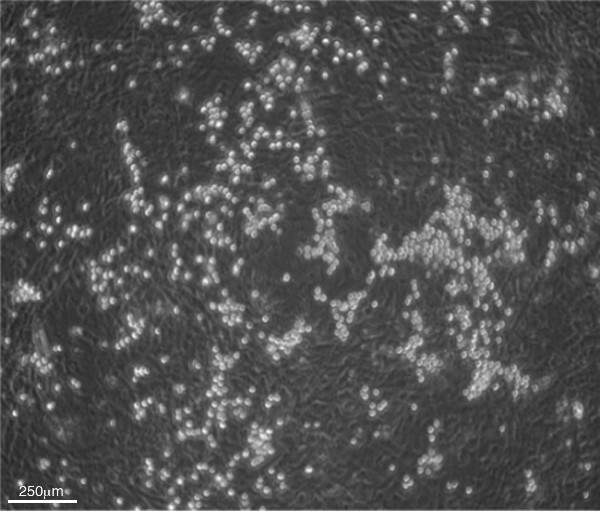 Under ideal conditions, they appear as compact colonies of cells surrounded by a shiny halo in phase contrast microscopy (Figure 1). These cultures must be monitored daily. Depending on the confluence of the cells, media can be changed or cells can be split. Neighboring mESC colonies should not come to the point of contact with one another. A normal, healthy culture of undifferentiated mESCs is an essential starting point for in vitro T cell differentiation. Upon initiating co-culture, it is recommended that cells be fully confluent without being overcrowded. This is so the majority of cells harvested for seeding cells onto OP9 monolayers are mESC (rather than feeder cells). If major differences in confluence are observed among the various mESC clones to be differentiated at day 0, then it would be best to remove MEFs by pre-adherence to tissue culture dishes (as in step 3.4.3-3.4.6 using complete ES cell media) before counting the mESCs for co-culture seeding. OP9 cells must be well maintained prior the co-culture initiation (as described in section 2.4). In addition, it is thought that OP9 cells lose some of their properties with prolonged culture and/or pronounced increases in their proliferation rate.7 Avoiding split ratios beyond 1:5 during maintenance of OP9 cells, and discarding continuous OP9 cultures after six weeks, will help avoid these pitfalls. At initial cell seeding and cell transfer steps of the co-culture (day 0, 5, 8, 12, 16), OP9 monolayers should be within an optimal range of confluence. Figure 2 shows the low (Figure 2A) and high (Figure 2B) ends of the range of OP9 cell confluence advisable for use as co-culture monolayers. An example of an over-confluent plate is shown in Figure 2C. Failure to maintain optimal confluence may induce formation of adipocytes (Figure 2D) that, in large amounts, can negatively affect the co-culture. On day 0, the co-culture is started on OP9 cells rather than OP9-DL1 cells since mesoderm formation is favored on OP9 cells. Cells are plated on OP9-DL1 cells monolayers beginning on day 8 to induce T cell production. While some mESC clones will visually display robust and quantitative (~90%) formation of mesoderm-like colonies by day 5 of co-culture (Figure 3A-B), others can display delays at this step (Figure 3C-F). Under the microscope, the mesoderm-like colonies derived in this assay have been variably described as resembling wagon wheels or craters (Figure 4A) or, starbursts or florets (Figure 4B). When multiple ESC clones are being differentiated in parallel, it is possible that some co-cultures will be ready for the day 5 passage on time, while others lag behind. In this case, it is advisable to delay the passage of all the co-cultures until the slower clones catch up to the others. The delay seems not to do any harm to the “on time” co-cultures, but benefits the subsequent differentiation of the slower clones a great deal. Day 8 (i.e., three days after mesodermal colony transfer) sees the emergence and accumulation of HPCs. HPCs are visible as shiny clusters of cells that are loosely adhered to the OP9 feeder cells (Figure 5). A careful washing procedure, using a pipette and the media on the dish, will detach and collect the HPCs while leaving the OP9 monolayer mostly intact (Figure 6A-C). This is perhaps the most technique-sensitive step of the protocol. It takes some practice to find the appropriate motions and media ejection pressure to achieve the desired balance of maximal harvest of HPCs with minimal disruption of the feeder layer. It is acceptable if some of the OP9 monolayer lifts off, since the majority of any stray monolayer will be captured in the 40 μm nylon mesh after filtering. Figure 6D shows a monolayer after excessive pipetting leading to greater monolayer disruption than necessary. During this washing step, it is important to check under the microscope whether or not all the HPCs have been collected, and adjust the washing pressure accordingly. Progress of the co-culture can be monitored by flow cytometry. To specifically analyze the non-erythroid hematopoietic progeny of the ESC, it is important to first gate on live CD45+ cells. This step screens out the OP9 cells from the analyses, while use of DAPI or other nuclear staining dye enables the exclusion of nonviable cells. 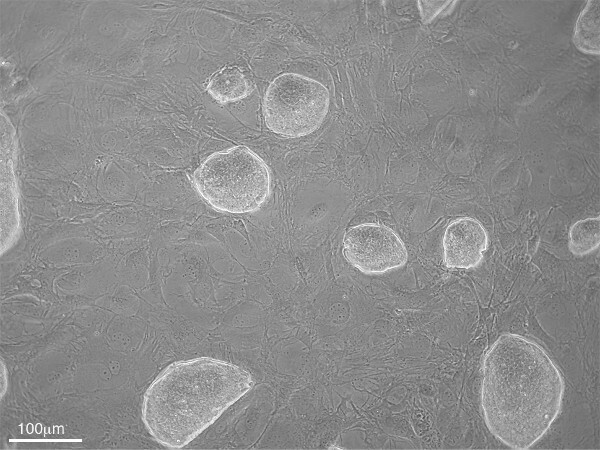 By day 12, many clusters of small, round, shiny cells should be visible. It is not necessary to count the cells at this stage. But we have observed that live, gated flow cytometry event counts are typically in the range of 1-3 x 105 per day 12 co-culture well. Flow cytometry analyses of live-gated cells differentiated on the OP9 monolayer will yield erythroid (CD45neg, TER119+) and monocytic (CD45+, CD11bhi) lineages (Figure 7A). Analyses of live, CD45+ cells differentiating on OP9-DL1 monolayers should reveal markers characteristic of CD4/CD8 double negative (DN)-1 (CD44+, CD25neg, CD4neg, CD8neg) and DN2 (CD44+, CD25+, CD4neg, CD8neg) stage T cells (Figure 7B). By day 16, there is a significant increase in the amount of small, round, shiny cells in the cultures. On OP9-DL1s, T cell differentiation products progress to the DN3 (CD44neg, CD25+, CD4neg, CD8neg) and DN4 (CD44neg, CD25neg, CD4neg, CD8neg) stages. 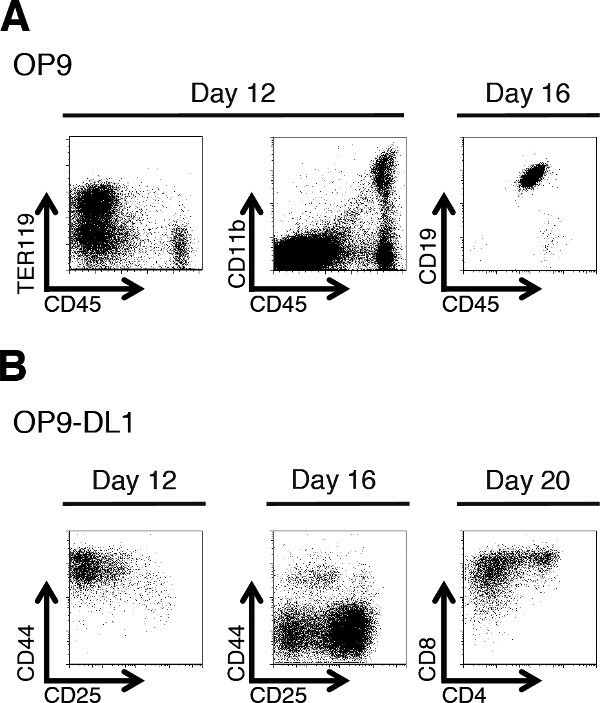 Some DP (CD4+, CD8+) T cells can also begin emerging by day 16 (Figure 7B). HPCs seeded on OP9 cells yield B cells (CD19+) by day 16. By day 20 of OP9-DL1-mESC co-culture, there will be large amounts of DP T cells and single positive (SP) CD8+ T cells present (Figure 7B). Figure 8 provides a diagram summarizing the key steps of the above procedures, and the suggested analysis time points during co-culture. Figure 1. Phase contrast microscopy image of undifferentiated mESCs (sharp edged colonies) growing on top of a MEF monolayer (100X magnification). Figure 2: Phase contrast microscopy images of OP9 monolayer confluency. (A) Lowest and (B) highest confluency levels advisable for co-culture passage/seeding (40X magnification). (C) Example of an over-confluent OP9 monolayer (40X magnification). (D) Over-confluent OP9 monolayer (200X magnification) with adipocyte formation (large, vesicle containing, cells). Figure 3: Phase contrast microscopy images of mesoderm-like colony formation at “day 5” of co-culture. 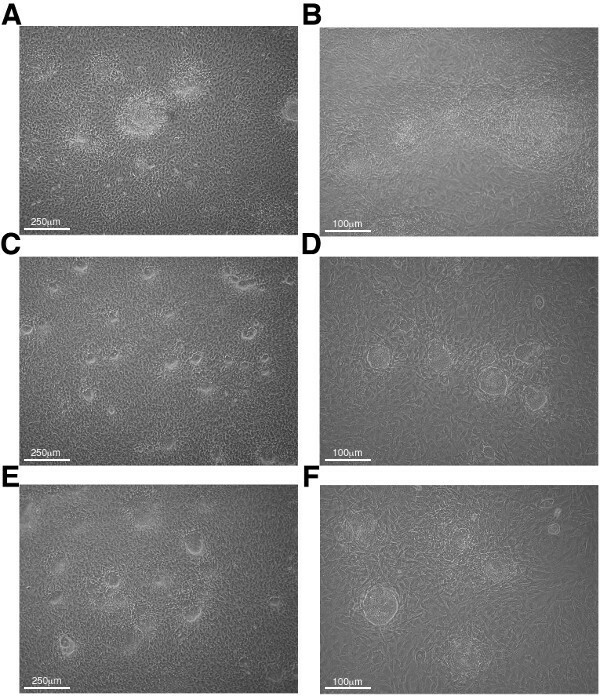 (A) 40X and (B) 100X views of co-culture plates with >90% mesodermal colony differentiation. These plates are ready for day 5 passage. (C-F) Examples of Day 5 co-culture plates that require 1-2 day postponing before transfer (C&E, 40X magnification, D&F, 100X magnification). Figure 4: Phase contrast microscopy images of the variety of mesoderm-like colony formations at day 5 of co-culture. (A) The colony morphology referred to as “craters” or “wagon wheel.” (B) The colony morphology referred to as “starburst” or “florets” (200X magnification). Figure 5. Phase contrast microscopy image of day 8 co-culture plate with clusters of small, round, shiny HPCs on an OP9 monolayer (40X magnification). Figure 6: OP9 monolayer after HPCs collection on co-culture day 8. (A-C) Appropriate range of disruption of OP9 monolayer after careful washing to harvest HPCs. (D) An example of an OP9 monolayer that has been over-disrupted by the day 8 HPC harvesting procedure. Figure 7: Representative flow cytometry (FACS) analyses at particular time points during mESC differentiation in vitro. (A) Staining for erythroid (left), monocytic (middle) and B cell (right) products of mESC-OP9 co-culture at day 12 or 16 as indicated. (B) Staining for developing T cells at the indicated time points of mESC-OP9-DL1 co-culture. Please see text for detailed descriptions of the immunophenotypes. Figure 8. Diagram of the steps of the mESC-OP9 co-culture procedure. (A) The key cell transfer steps of the first eight days of co-culture. The approximate number of cells seeded on OP9 cells at days zero and five are indicated. (B) The day 8 transfer step and the expected cellular differentiation products detected by flow cytometry at key timepoints of co-culture. Please see text for detailed descriptions of the immunophenotypes. The OP9-DL1 co-culture system has been utilized to study the role of various gene products during the development of blood cell types from stem cells.8,12,13 It has also proven an effective model to study the function of gene regulatory DNA during cellular differentiation.9,14 Using this approach as an alternative to whole mouse models can yield considerable savings in time and cost of experiments that address many basic questions in hematopoiesis. However, adaptation of this protocol for these purposes requires cognizance of the potential variability among mESC clones that would be used in these procedures. The timeline of the published protocol is expectable from the average, well-maintained, non-manipulated mESC line.7 In addition, mESC clones selected for the generation of chimeric mice usually are of higher quality and will perform very robustly in OP9 co-culture. On the other hand, mESC clones emerging directly from stable transfection with an ectopically integrated transgene will display varying degrees of initial differentiation efficiency ranging from average to below average. The protocol described here provides for a strategic 1-2 day delay of the day 5 passage step to even out these potential differences prior to induction of hematopoiesis in vitro. The day 8 passage is the step at which the execution of this protocol has the most potential for error. Patience, practice and careful observation will enable one to develop the technique that optimizes HPC harvest while minimizing OP9 monolayer disruption. Beyond the key day 5 and day 8 steps, the critical parameters involve meticulous cell culture maintenance (particularly OP9 cells, as described above) and special attention to the reagents used in the protocol. The most critical reagent is the FBS. Distinct lots of FBS will vary markedly in their ability to support this procedure. Multiple lots must be tested in order to determine which will yield robust differentiation in this assay. This co-culture system has its limitations. For example, this model does not support the differentiation of single positive CD4 cells. One reason for this is the lack of expression of the major histocompatibility complex (MHC) Class II antigen presentation infrastructure in the OP9 cells.1 Cell surface presentation of antigens by MHC Class II is required for proper development of CD4 SP cells. The CD8 SP cells that do emerge represent a mix of mature and immature CD8 SP thymocyte stages.1 Furthermore, successful transplantation of mESC derived T cell progenitors into a mouse requires prior passage through fetal thymic organ culture.1 Nevertheless, this technology has proven its promise as a powerful investigative approach to both cellular and molecular questions in blood and immune system development that were previously only possible to explore in vivo. Thus, aside from providing a novel way to make more rapid progress on these questions, wider adoption of the OP9-ESC co-culture system will have the broader impact of reducing the use of experimental animals. We thank Joon Kim for expert flow cytometry assistance. Research in the authors’ labs is supported by the SCORE program of the National Institutes of Health (grant SC1-GM095402 to B.D.O) and the Canadian Institutes of Health Research (to J.C.Z.P.). J.C.Z.P. is supported by a Canada Research Chair in Developmental Immunology. The biomedical research infrastructure of Hunter College is supported in part by the NIH Research Centers in Minority Institutions (RCMI) program via grant MD007599. We also acknowledge the New York State Stem Cell Science Program (NYSTEM) for its support of the initiation of stem cell research at Hunter College via grant C023048. OP9 cells Cells can be obtained from the Riken Laboratory Cell Repository (Japan). OP9-DL1 cells Cells can be requested from the Zúñiga-Pflücker laboratory. Schmitt, T. M., et al. Induction of T cell development and establishment of T cell competence from embryonic stem cells differentiated in vitro. Nat Immunol. 5, 410-417 (2004). Pui, J. C., et al. Notch1 expression in early lymphopoiesis influences B versus T lineage determination. Immunity. 11, 299-308 (1999). Nakano, T., Kodama, H., Honjo, T. Generation of lymphohematopoietic cells from embryonic stem cells in culture. Science. 265, 1098-1101 (1994). Schmitt, T. M., Zuniga-Pflucker, J. C. Induction of T cell development from hematopoietic progenitor cells by delta-like-1 in vitro. Immunity. 17, 749-756 (2002). Chen, J., Lansford, R., Stewart, V., Young, F., Alt, F. W. RAG-2-deficient blastocyst complementation: an assay of gene function in lymphocyte development. Proceedings of the National Academy of Sciences of the United States of America. 90, 4528-4532 (1993). de Pooter, R. F., Cho, S. K., Carlyle, J. R., Zuniga-Pflucker, J. C. In vitro generation of T lymphocytes from embryonic stem cell-derived prehematopoietic progenitors. Blood. 102, 1649-1653 (2003). Holmes, R., Zuniga-Pflucker, J. C. The OP9-DL1 system: generation of T-lymphocytes from embryonic or hematopoietic stem cells in vitro. Cold Spring Harb Protoc. 2009, (2009). Arsov, I., et al. A role for autophagic protein beclin 1 early in lymphocyte development. J Immunol. 186, 2201-2209 (2011). Lahiji, A., et al. Complete TCR-alpha gene locus control region activity in T cells derived in vitro from embryonic stem cells. J Immunol. 191, 472-479 (2013). Hirashima, M., Kataoka, H., Nishikawa, S., Matsuyoshi, N., Nishikawa, S. Maturation of embryonic stem cells into endothelial cells in an in vitro model of vasculogenesis. Blood. 93, 1253-1263 (1999). Nishikawa, S. I., Nishikawa, S., Hirashima, M., Matsuyoshi, N., Kodama, H. Progressive lineage analysis by cell sorting and culture identifies FLK1+VE-cadherin+ cells at a diverging point of endothelial and hemopoietic lineages. Development. 125, 1747-1757 (1998). de Pooter, R. F., et al. Notch signaling requires GATA-2 to inhibit myelopoiesis from embryonic stem cells and primary hemopoietic progenitors. J Immunol. 176, 5267-5275 (2006). Watarai, H., et al. Generation of functional NKT cells in vitro from embryonic stem cells bearing rearranged invariant Valpha14-Jalpha18 TCRalpha. 115, 230-237 (2010). Pipkin, M. E., et al. Chromosome transfer activates and delineates a locus control region for perforin. Immunity. 26, 29-41 (2007).